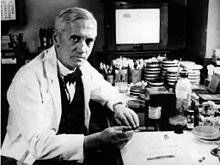 Sir Alexander Fleming, FRSE, FRS, FRCS(Eng) (6 August 1881, in Lochfield, Ayrshire – 11 Mairch 1955, in Lunnon) wis a Scots biologist an pharmacologist faur-kent for diskiverin the enzyme lysozyme in 1923 an the antibiotic penicieelin in 1928, for which he shaired the Nobel Prize in Physiology or Medicine in 1945. Wikimedia Commons haes media relatit tae Alexander Fleming. This page wis last eeditit on 29 Mey 2018, at 21:29.